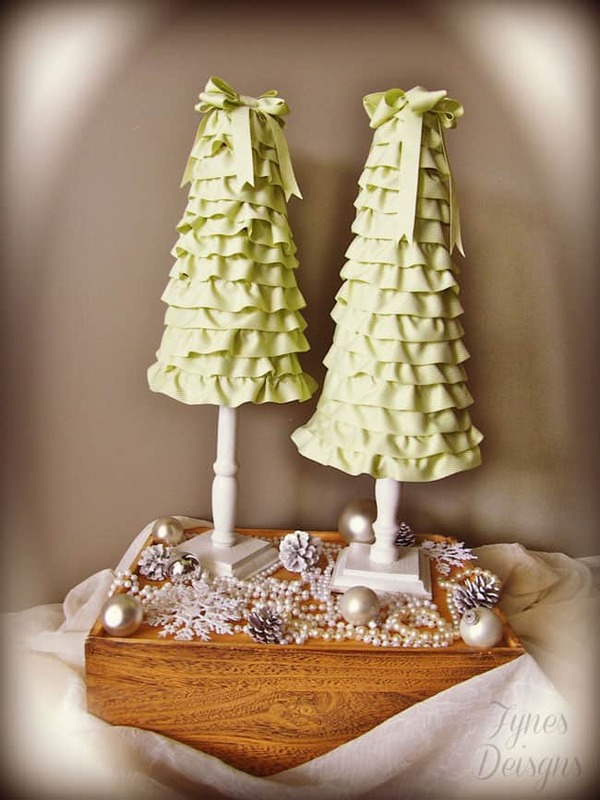 Ruffle Christmas Trees. The Cheap Way! 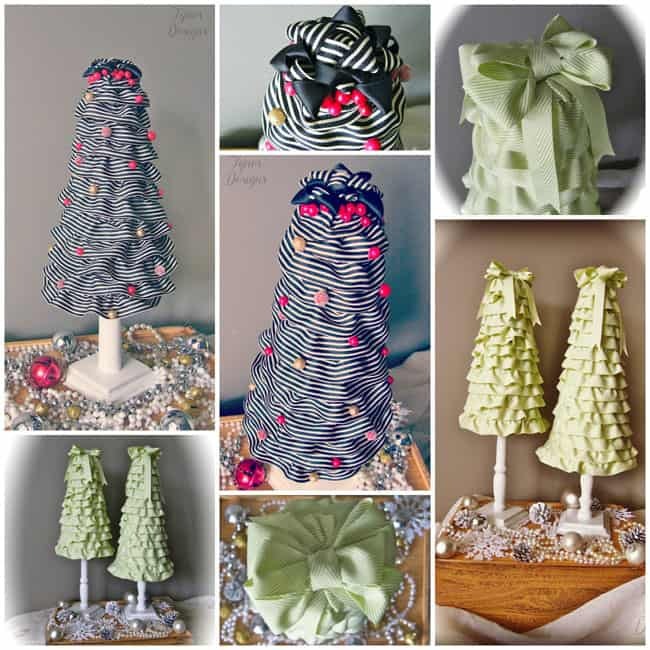 I’m sure you have all seen a version of the Ruffle Christmas trees on Pinterest. I must admit that is where I originally seen the idea. The best tutorial I’ve found is on Shanty 2 Chic. I love this site they have great ideas! 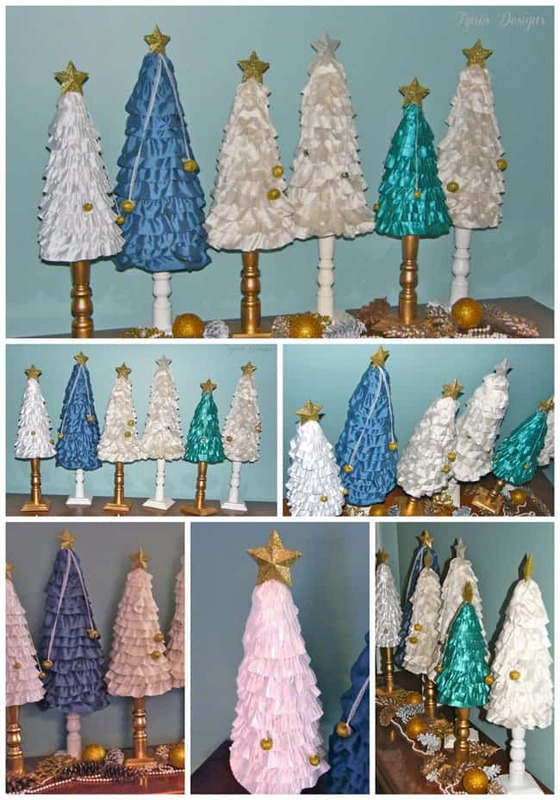 Their ruffle trees are from back in 2010 so it is certainly not a new idea. However, why I have you here today I want to share my idea for whipping them up the CHEAP way (under $5)!! If you’ve priced styrofoam cones you’d know you can’t get one for under $5, they are more like $10-30 depending on the size you want. And you may have seen tutorials for making trees out of poster-board, but how sturdy are those anyway? My idea is cheap, sturdy, super quick, and ANY monkey can do it… even my 18 month old! So here it is… PLANT POTS!! These plant pots are from the Dollar store! 6-10 pots for $1 (depending on the size)!!!! How do you make them into a tree?? Turn them over and stack largest to smallest, and Viola Cone shape a.k.a- Tree!! From this point on you can decorate as you wish. Of course you’ll have a hard time finding a plant pot that is pointy on the bottom (have a look how I fixed this issue). Plant pots (I used 4 or 5) you can use as many as you like depending how tall you’d like it to be. A spindle cut to desired length and spray painted (mine were about 12″ and I used the most decorative piece, from my ma’s attic (free)). Screw your deck cap to your piece of spindle. Screw your largest plant pot upside down onto the other end of the spindle (at this point it will look like a lamp) Hot glue around the lip on the next smallest pot and put on top of the first. Continue until all pots desired are in place. Cut styrofoam balls in half (largest ball should be similar in size to the bottom of the last pot). Poke skewer through the three halves, leaving skewer visible on each end. I also made a few without this addition and used bows instead of stars. Drill a small hole in the centre of the last plant pot and stick the skewer in, put hot glue on the plant pot and adhere the half ball. Now you have a pointy tree, and the remaining skewer is how you’ll put a star on top. My stars are from the dollar store, I removed the hanging string and cut a small slit in the armpit of the star, then slid it onto the skewer). Cut strips of fabric (I used silk and taffeta) approx. 1.5″ in width and about 6m in length. Or you can use ribbon (mine is May Arts). Run a line of hot glue along the rim of the plant pot, stick fabric and while the glue is still hot pinch the fabric together creating ruffles. (I did try ruffling it with the sewing machine first but it was an unnecessary step). only do about 3″ at a time or the glue will dry and you’ll miss prime ruffling. Continue to the top. Before you put the star on cut a length of skinny lace or Metallic string that coordinates with your fabric (mine is May Arts SJ01 Metallic string). Attach bells to each end. Tie middle of string around skewer. That’s it!! 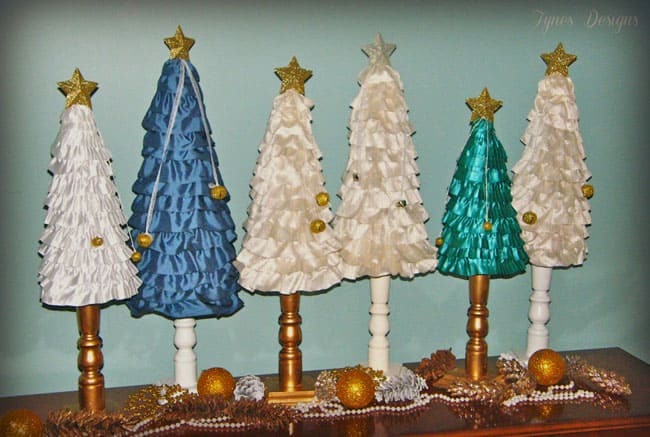 Now you have a beautiful tree to use in your holiday decorating, and can you believe how cheap they are? I hope you enjoyed this tutorial, if you make a tree be sure to link it up or post it on Fynes Designs Facebook page, I’d love to see it! Have a great day! There’s a forest growing in your house 🙂 Super cute. They were so popular I only have two left 🙁 Thanks, I love them too! Your trees are awesome! I just came back from store, I saw the pots there!